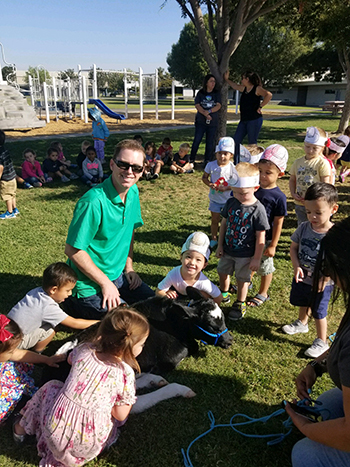 For young children, the chance to pet a calf can really be a memorable experience. It’s not that I don’t have enough to do already. Yet for some reason, when I get asked to talk to a group of preschoolers about dairy, I always say yes! For the last two years I have been asked to speak to a large preschool about dairy cows. At first I was a bit apprehensive. What in the world am I going to do with over one hundred preschoolers? The answer: “moo moos,” or baby calves. Everybody loves a little calf! So I picked the prettiest heifer calf I had, a few bags of feed, a giant calf bottle, and ran to the school. When I arrived, the kids were all still in their classrooms, oblivious to me and my little friend outside. As I set up, my pretty little calf decided it was playtime. What I didn’t realize was that my fancy heifer was also quite rambunctious. “Great,” I thought. This is what I need. A 70-pound, hooved Labrador retriever with zero sense of personal space or coordination running around the little ones! I could see it now, making front page in the local paper: “Heifer tramples children at local preschool, local dairyman to blame.” Fantastic! But as soon as the kids came out the little heifer settled down, found a spot to lay and waited for the extreme toddler scratch and sniff which was to follow. As the kids gathered around, their eyes lit up. “Oh, a cow!” they would scream with no regard to their proximity to each other. All they could think about was the little moo cow in front of them. One by one, the classes sat down around me, flanking me on three sides as if they were going to charge me at any moment. Surprisingly, the children remained seated as we talked about what sound a cow makes and all the things that they eat. Of course, some of the children wanted to try some of the feed I brought, but that is a story for another day. As we wrapped up our time together, each child got the opportunity to pet the little heifer that they had been eyeing during the longest 5 minute talk of their life. It was great to see their eyes as they got the opportunity to pet a baby “moo moo.” To me, this alone was worth the effort of getting the calf there. This, however, is not where the story ends. How do you seal the deal with kids? First let them pet a baby calf . . . then fill them full of Kozy Shack Pudding! There were whispers about this farmer being their favorite, but I’m not bragging or nothing. I’m way too mature for that . . . wink wink.